This 59 sq.m one bedroom with one bathroom and living room is an Ideal for quality living at Centara Avenue Residence. Comes with fully fitted European kitchen, fully air conditioned and fully furnished, direct pool view with spacious balcony. 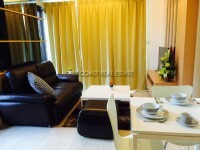 Centara Avenue Residence is located at heart of Pattaya city. Within 5 minutes you can reach anywhere in Pattaya. Facilities at Centara Avenue Residence include covered / underground parking, communal swimming pool, gym lounge, and more to find by your self here. Available for rent long term only. Living area : 59 sqm.